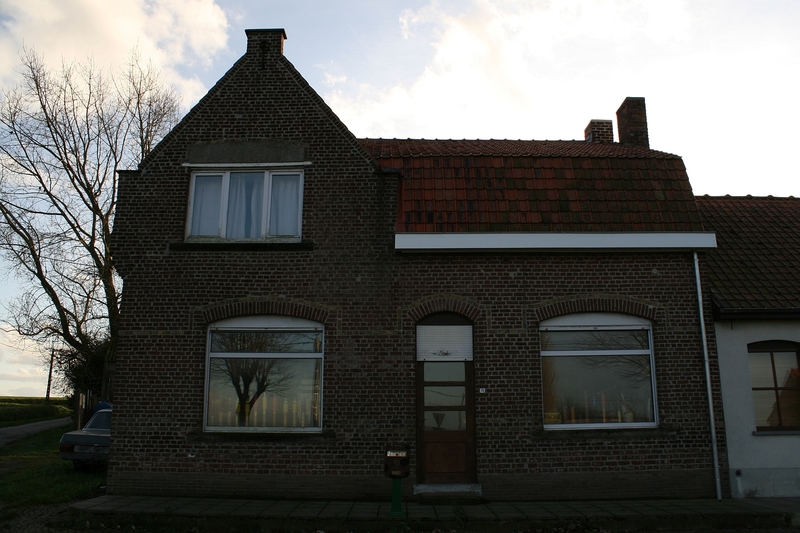 We are now a little over a mile west of Wytschaete, in an area that was just behind the British lines when the Battle of Messines began. Our next stop, Irish House Cemetery, is just a short distance north of the main road at this point, as the signpost confirms. Note the shells visible in the windows of this house on the main road (above & below). 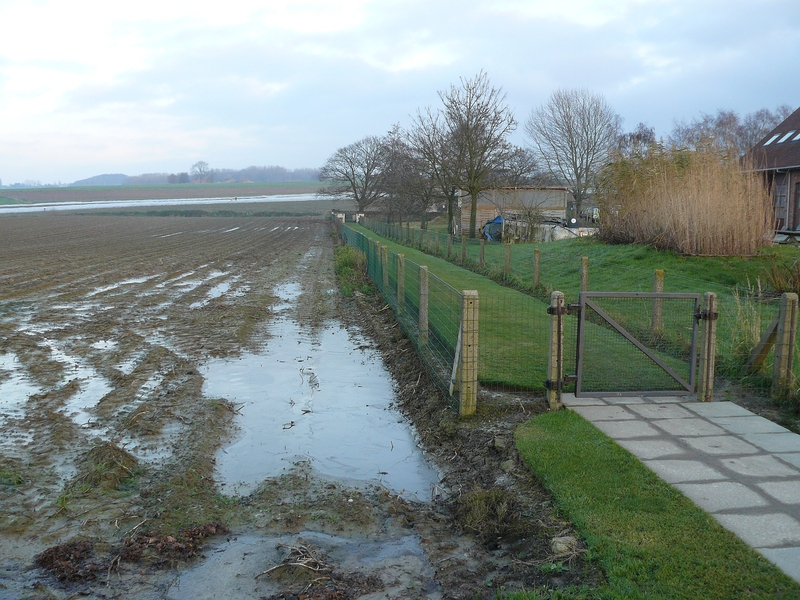 Above & below: The cemetery entrance is down this grass path, alongside a field that serves as yet another reminder of the conditions frequently faced by soldiers of both sides during the war in Flanders fields. 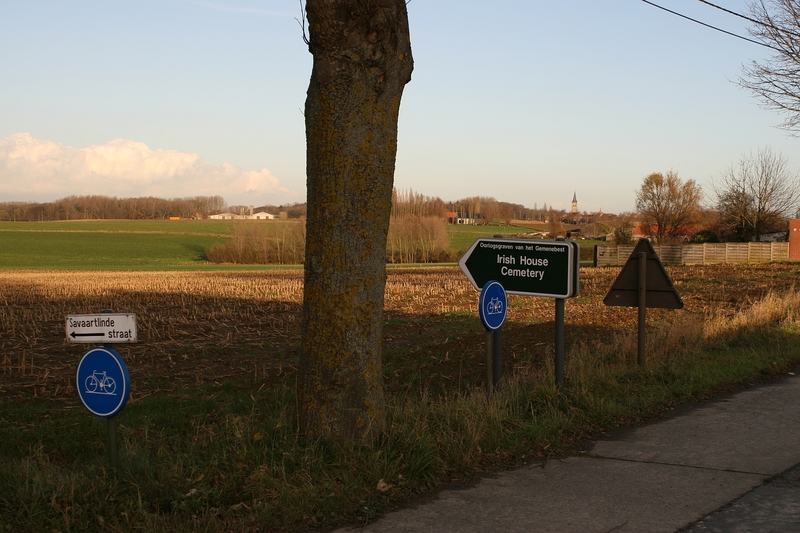 This little cemetery was begun by the 16th Irish Division at the start of the Battle of Messines. 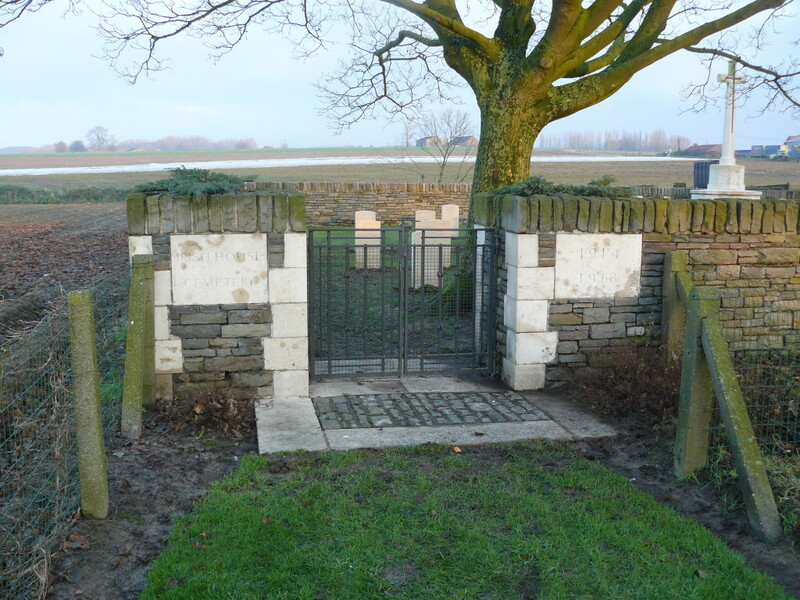 Two of the memorials we saw in the previous post, you will remember, commemorated the men of the 16th Division. 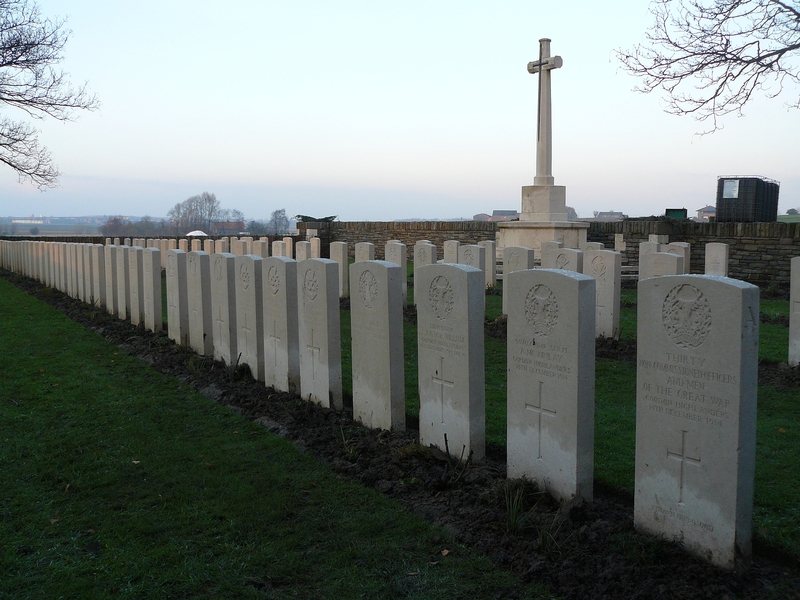 There are just five rows of headstones here, the majority from 1917; nearest the camera are the two final burials, both from early September 1918. 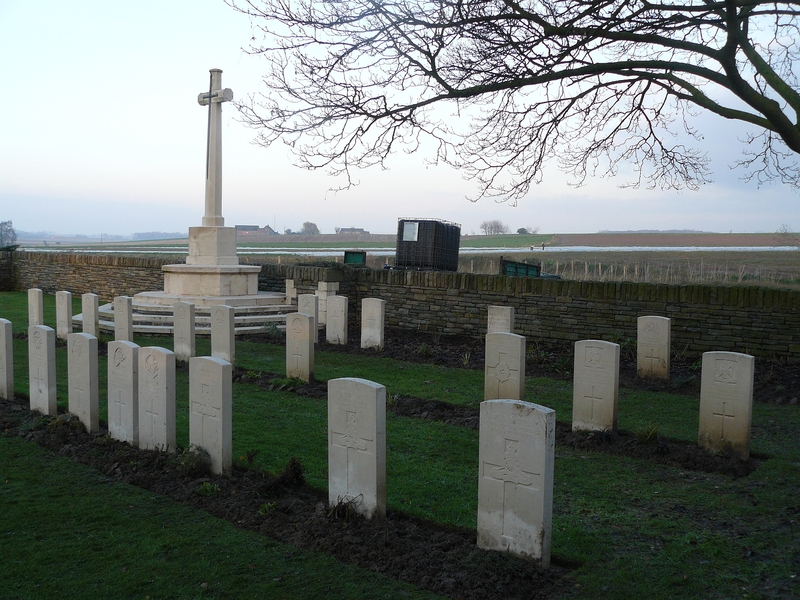 No less than 31 of the 77 identified burials here lost their lives on 7th June 1917, the first day of the battle. Unusually, you will notice a second name on Lance Corporal Scott’s headstone, that of his 20 year old brother, Private W. Scott of the Border Regiment, killed on 30th November 1916, whose name appears among the 72,000 missing on the Thiepval Memorial on the Somme. 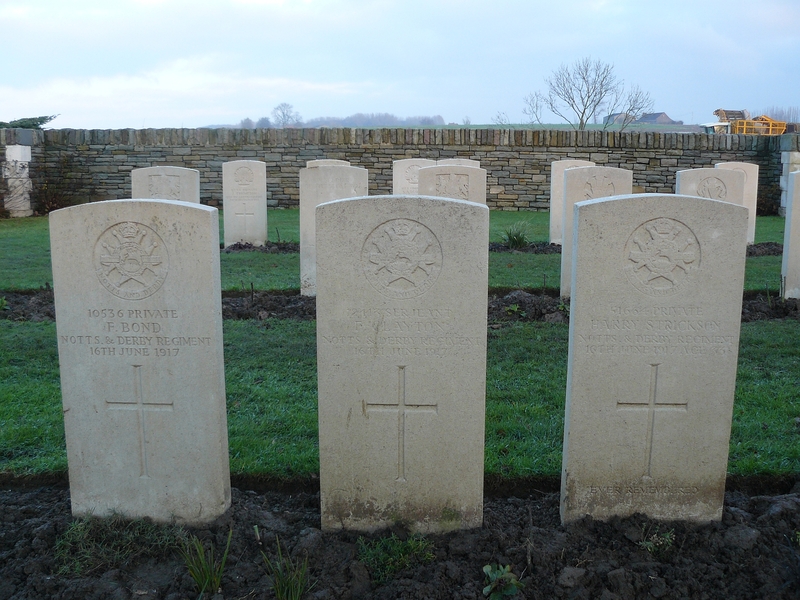 These three men of the Sherwood Foresters, were, I suspect, all killed together on 16th June 1917. Three more of the Irishmen killed on the 7th June 1917. 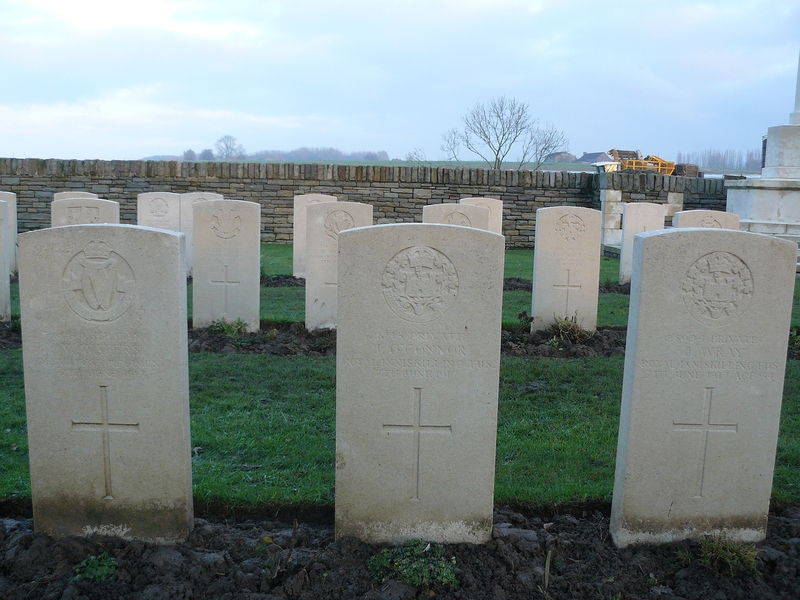 Rows B (nearest camera), C & D. The single German headstone in the back row marks the graves of a number of German soldiers. One headstone, thirty burials. 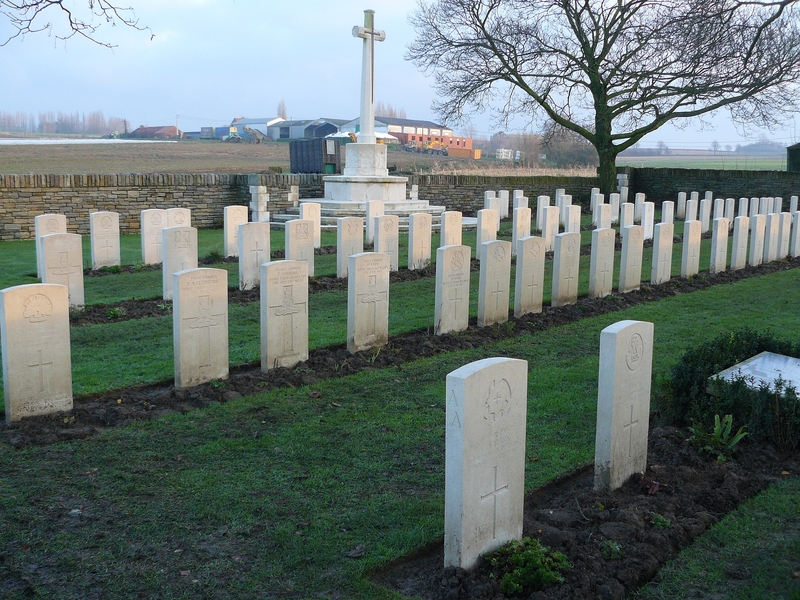 These Gordon Highlanders were killed attacking Wytschaete back in December 1914 and were reburied here in June 1917 by the men of the 16th Irish Division. Row A, with the single headstone to the thirty Gordon Highlanders nearest the camera. 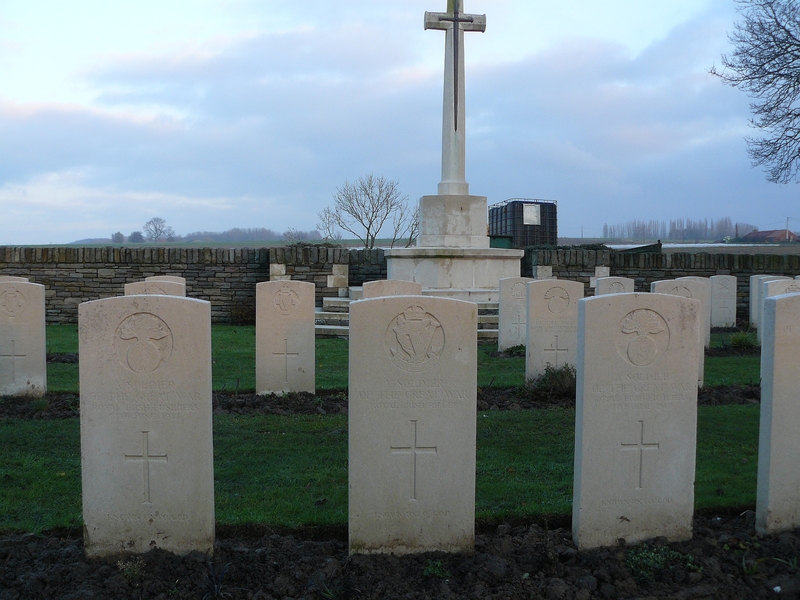 In total forty of the burials here, like the Irishmen pictured above, all killed during the Messines battle, are unidentified. As we take our leave Mont Kemmel, or the Kemmelberg if you prefer, looms above the surrounding countryside, its strategic importance obvious. This, however, is the closest we shall find ourselves to it on this tour. Our journey now takes us south, to another little cemetery that we caught a glimpse of in the previous post. Thank you for these photographs, I only found out a short time ago that a relative John Robert Cousen died in ww1 and is buried here in the Irish cemetery. 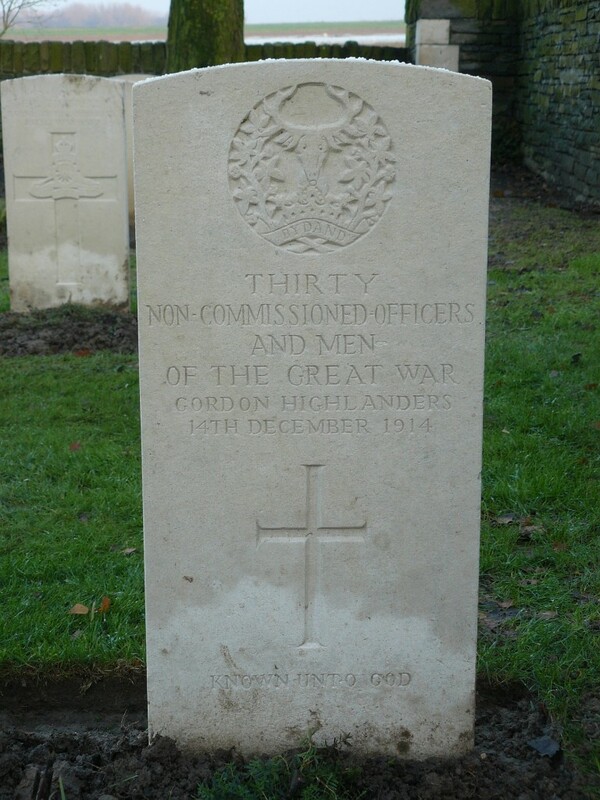 He served in the manchester regiment and died on 13/6/17. 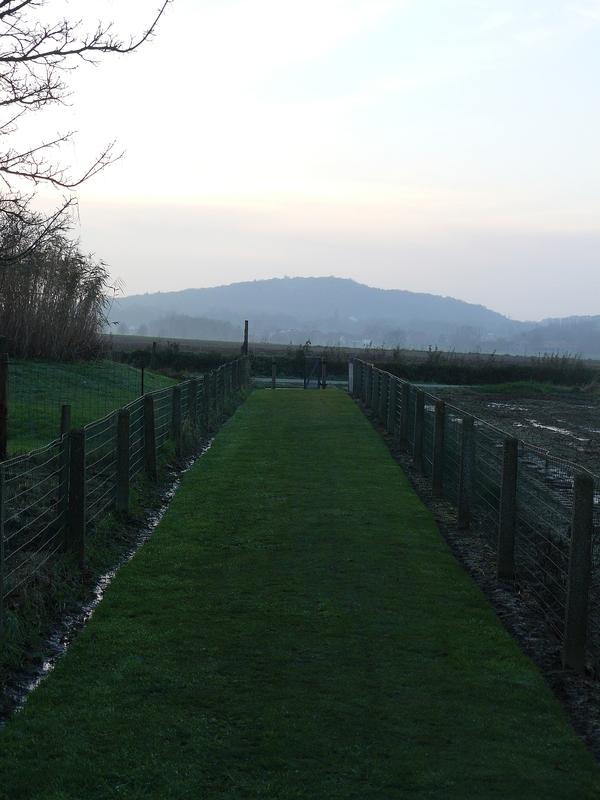 We are hoping to visit the cemetery in spring 2015 but in the mean time can share the photographs with the family. You are welcome Jean. I hope you have a good trip when you get the chance to visit. You are welcome Colleen. Lucky I took a close-up. Do grab a copy if you haven’t already. Thank you for these wonderful photos. I reckon a distant cousin of mine is one of the 30 Gordon Highlanders – Pte 3/5989 Murdo Montgomery 1st battalion, died 14 Dec 1914. Thanks for commenting SP. Wow. It’s a very unusual thing to see so many men remembered one one single headstone. Thanks I think my dad’s Uncle is one of the 30 Gordon Highlanders too. 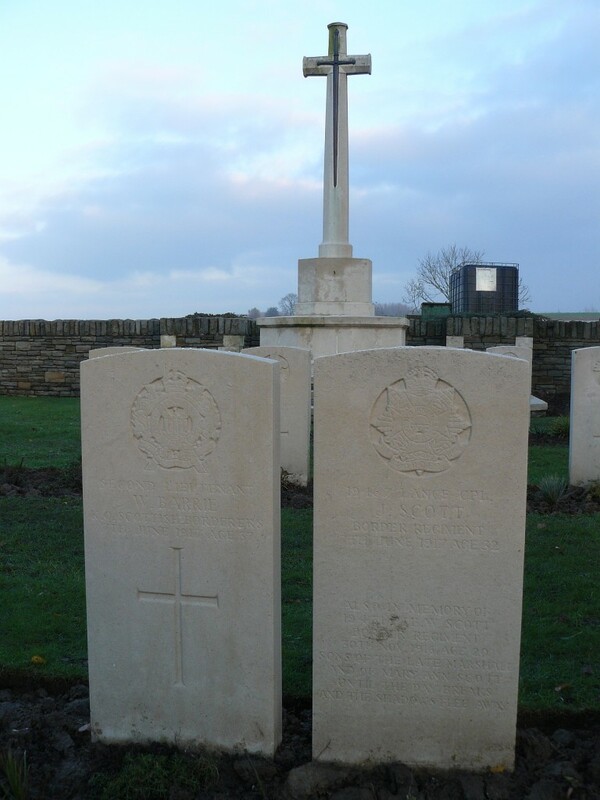 Alexander Innes from Lanark, 1 Btk too, died 14 th Dec as well. How honourable of the Irish soldiers to bury their bodies and remember them. Thanks from my family, Scots and Irish stuck together during horrific times. Hi Lynda. Thanks for commenting. How interesting that two of you noticed that headstone in the last few weeks. I am researching Lanark war memorial WW1 and was stuck on Alexander Innes who is commemorated on the monument – there seemed no link in census and birth records. I was very pleased to see that there is a link – found through you impressive website. We do not however have any further information other than his service number, place of birth and place of enlistment. Any information that Lynda James has would be greatly appreciated. Alexander is also commemorated on New Lanark War Memorial and I wold pass on the information to New Lanark Trust for their records. Hi Graham. Thanks for your kind words. I hope Lynda reads your comments and perhaps you can make contact. Hello again Graham. Good stuff. And thanks for the acknowledgement in your research too. 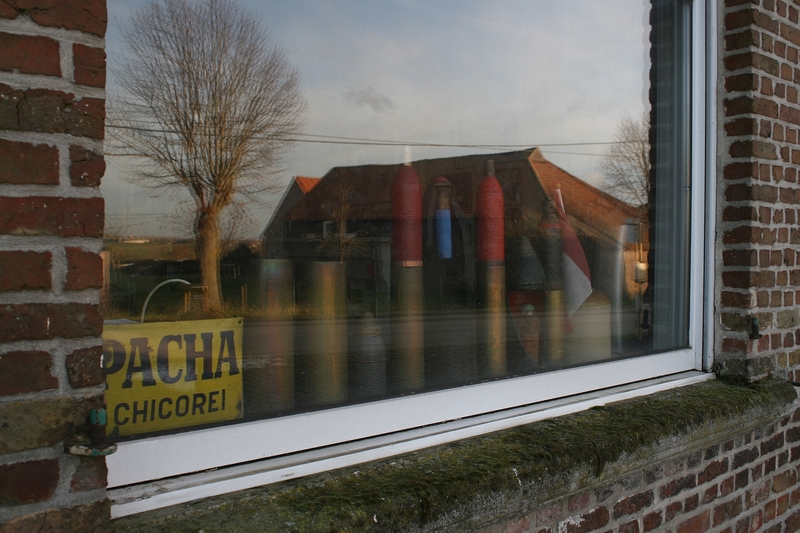 Hello we have just returned from a trip to Ypres. We visited the Irish house cemetery on Tuesday 13/6/2017 100 years to the day that my relative Lance Serjeant J R Cousen 16962 of the Manchester Regiment 11th Bn was killed in action. An emotional experience. 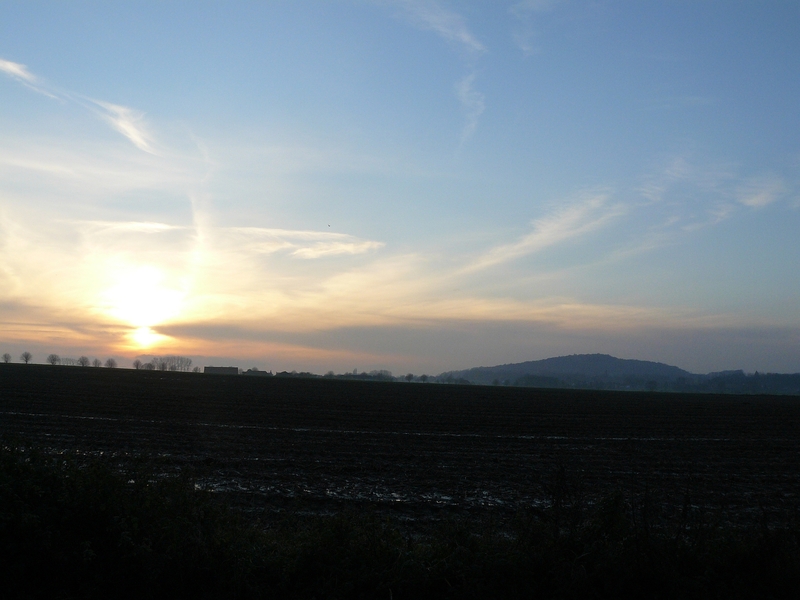 Thanks for all the photos magic finger, it is a very quiet and peaceful place. We took some pics and are happy to share with anyone. You are most welcome Jean. My photos will mean more to you now that you have visited. I think it’s a beautiful spot and I imagine it was a very moving experience for you, and not one that I have ever (or will ever) experienced. My family, on both sides, were lucky enough to survive the war reasonably intact. One of my Grandfathers was in the Mercantile Marine and as far as I know was never sunk, my other Grandfather was in Salonika and later wounded on the Somme, a Great Uncle won a M.C. 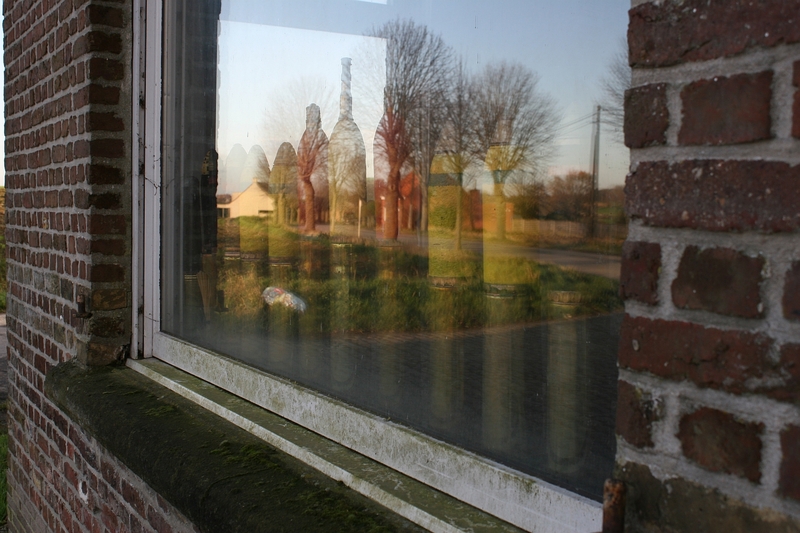 on 1st July on the Somme (and there can’t be too many of them!) and later spent more than a year as a prisoner, but all survived. And my Dad of course survived WW2, including being with the Americans during the Battle of the Bulge in late 1944. Not the best place to be at the time.